C1, C1E, C and CE). 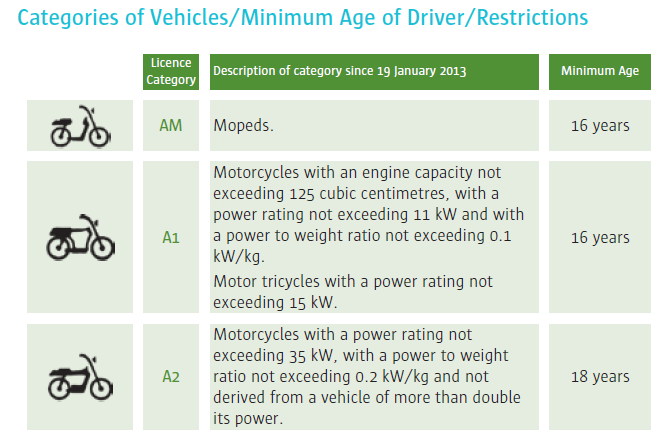 Equivalent licences are D1, ED1, D, ED, C1, EC1, C and EC. reduce fatalities and serious injuries on Irish and European roads. Step 5: Pass a 30-minute practical test. driving test centres and are usually taken one after the other. hours of periodic refresher training every five years. in a single day each year. Vehicles used for non commercial purposes such as driving as an unpaid volunteer. for your learner permit you must pass your driver theory test (see pages 17–18). the above and of ‘safety loading’ and ‘vehicle security’. normally resident in Ireland provided you return here regularly. A registered doctor or ophthalmic optician must fill in the eyesight report form. You must then sign it in front of them. A registered doctor must complete the medical report form. one if any of the following statements applies to you. 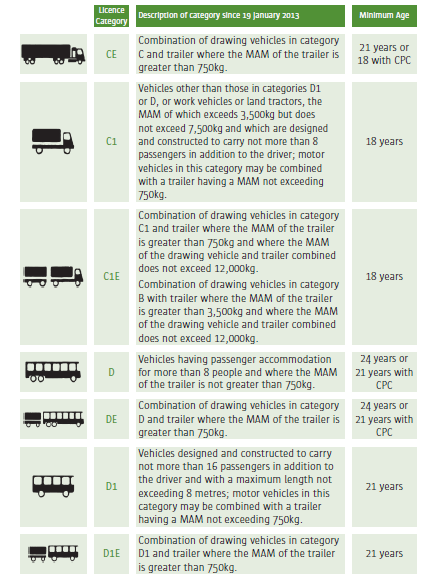 You are applying for a learner permit in any of the categories C1, C, D1,D, C1E, CE, D1E or DE. You will be 70 years of age or more on the first day the learner permit isbeing granted. You have any of the conditions listed in Appendix 1 at the back of this book. You are taking drugs or medications that are likely to affect your driving. an engine output of any size. 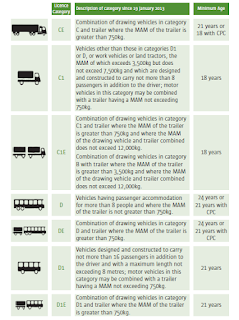 the combined MAM of the vehicle and trailer is no more than 3,500kg. than 3500kg but less than 7000kg. learner permit with you at all times when driving. also describes the different categories of vehicle to which the licences apply. first learner permit in the relevant category. 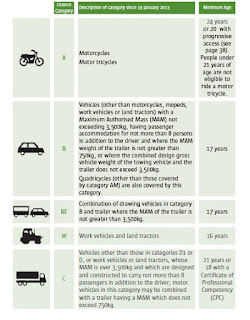 If you are under 16 years of age, you must not use any vehicle in a public place. may also be referred to as the Maximum Authorised Mass (MAM). should check the original legislation or ask a Garda. you are learning to drive or have been driving for many years. concisely how the law applies to all road users. a situation where no legal rule is in place. family’s life, as well as the lives of others. hit by a car at 30kmh, 1 out of 10 pedestrians will be killed. There are a number of skills expected of all road users, drivers in particular. a good level of driving control and expertise. a good knowledge of this book and putting that knowledge into practice. regularly to take account of new laws. to obey the rules may be considered when deciding whether or not you are liable. it does so by virtue of three basic rules. stop without causing a problem for anyone else on the roadway. The rule means you must be alert and exercise due care and attention at all times. to take account of all of the things that can change on any given journey. make full allowance for all other users on the road. It is in your interest to follow the basic principles of road safety when on the road.